Importing those assets can be done with the Character Maker. Golaem Crowd uses a dedicated animation engine, which can automatically retarget, blend and mix motions on any kind of morphology. 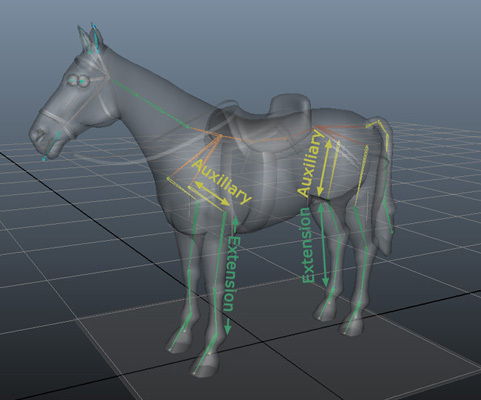 To perform these features, the Golaem animation engine uses its own representation of characters and motions, which should be mapped to the Maya joints representation. The representation of a character is stored in a Golaem Skeleton file (.gcha). It is created using the Character Tab of the Character Maker. A Bone: a Joint node in Maya is usually referred as a bone in this documentation. A Bone Chain: A bone chain is a list of bones that are hierarchically linked to each other, and representing a single "flow". It can be seen as all the bones that you have to go through to link two bones together. These two bones are then referred as the extremities of the bone chain. For instance, in the human skeleton as usually defined with the Maya joint system, we can consider a bone chain running from the clavicle to the wrist: none of the bones in the chain have more than one child, except the wrist which is the last bone of the chain. One can then consider five other bone chains for each finger. 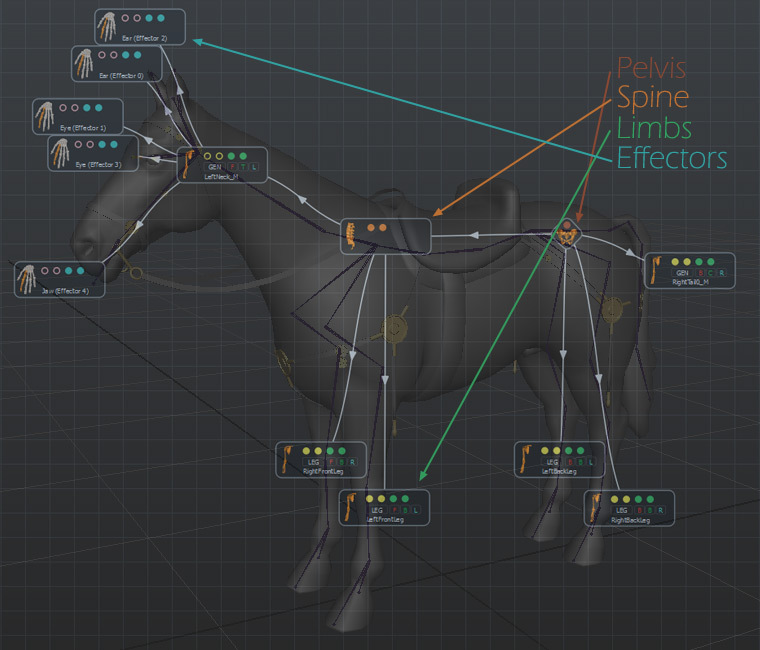 Unlike Maya skeletons which represents skeletons with only one kind of node (joint), the Golaem Skeleton uses several kind of nodes, each having different properties. 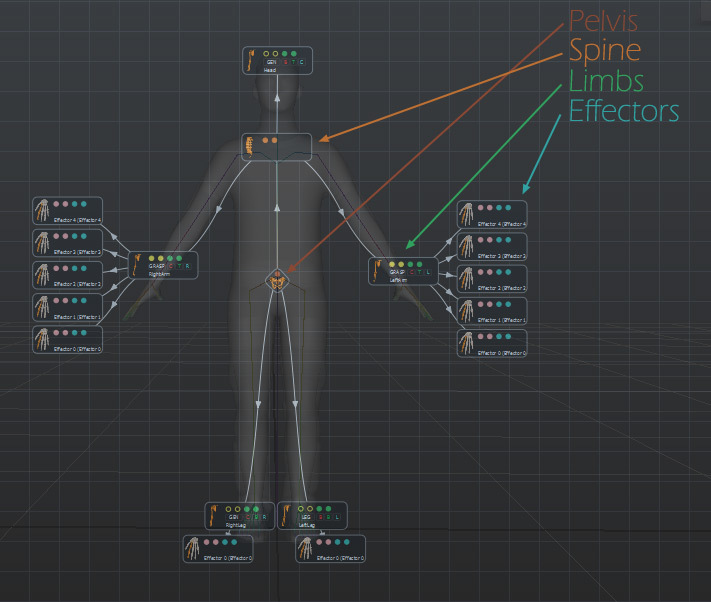 The pelvis node must be unique per character. It represents the origin of all other nodes and the first animated joint in the user skeleton representation. As stated by its name, it should usually be mapped to the "pelvis" joint of the user skeleton, even if there is a root bone, or ground level bone parent to this one. Spine bones should be children to either the Pelvis or another Spine, and should be mapped to a bone chain representing a spine in the user's skeleton. Spine contains one bone chain. Limb bones should be children to either the Pelvis or a Spine (they can't be children of an another limb), and should be mapped to a bone chain representing the limb part without multiple articulations (ie: from the clavicle to the wrist for a human arm, not including the fingers). Limbs contains two bone chains: Extension and Auxiliary bone chains. Effector bones should be children to limbs only. Several effectors may be attached at the end of each limb. For instance, in a human representation, the fingers are attached to the arm limb. Effectors contain two bone chains: Extension and Auxiliary Bone chains. The Extension Bone chain is the part of a bone chain which is really used to perform the extension action. For instance, on human arm, the arm bone chain goes from the clavicle to the wrist, but only the part going from the shoulder to the wrist is used to extend the arm and make the wrist (end of chain) reach a given position. That is what is called the Extension Bone Chain in Golaem Crowd. The Auxiliary Bone chain is the part before the Extension Bone Chain (from the clavicle to the shoulder in the previous sample). It almost does not contributes to the extension of the wrist. Bones within the Extension Bone Chain or the Auxiliary Bone Chain only bends on one side. In human hands, Auxiliary does not exist and Extension goes from the first phalange to the last phalange (If metacarpus are also animated they will have to be set in the Auxiliary part). In the front legs, Auxiliary part goes from the scapula to the humerus, and the Extension part goes from the radius to the metacarpal (cannon) bone. So the best thing to do in such cases is to separate the leg into two parts, bending on one way only within each bone chain. Consider also having at least two bones in the extension bone chain when it's possible. In the arms, Auxiliary part does not exist and Extension part is composed of the only 2 bones in the bone chain. The alien's arms are ended with a gun inside a "holster". The lower part and the upper part of the holster are each composed of 2 articulated bones, which compose the extension part of the Effectors. 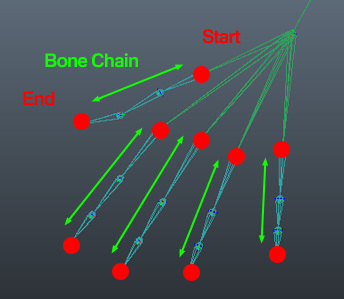 The Golaem animation engine does not record the orientation of every joint in the skeleton, but rather store the orientation of the beginning/end of auxiliary/extension bone chains, as well as the distance between the begin and the end of the bone chain. 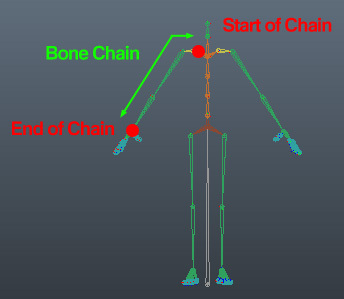 At runtime, the orientation of joints within the bone chain are computed thanks to a simple inverse kinematics algorithm. To do so, the animation engine needs to know on which local plane to solve the inverse kinematics. In simple terms, the animation engine needs to know in which direction does the elbow bend. IK Planes are configured in the Main Workspace of the Character Maker, by right clicking on the limb and choosing the Edit IK Normal Planes entry. Here is some documentation about how to check IK. But some joints that are present in the skeleton should not be animated this way (for instance: roll bones), and they can be excluded from the IK resolution. Bones IK exclusions are configured in the Main Workspace of the Character Maker, by right clicking on the limb and choosing the Edit Advanced Skeleton entry. Roll bones are configured in the Main Workspace of the Character Maker, by right clicking on the limb and choosing the Edit Roll Bone Parameters entry. When replaying a motion clip on a character, in order to determine how to apply and distribute the Squash’n Stretch ratio on the target character (at each frame and for each auxiliary/extension bone chain). Squash’n Stretch is configured in the Main Workspace of the Character Maker, by right clicking on a limb and choosing the Edit Squash’n Stretch Parameters entry. Golaem Crowd's animation engine handles blend shapes the same way it handles skeletons. Character files and Motion files store blend shape configurations, and blend shape animation is stored in Motion files. In order to play a blend shape animation on any character blend shapes also require motion mapping information. Blend Shape Groups act like channels on the skeleton. 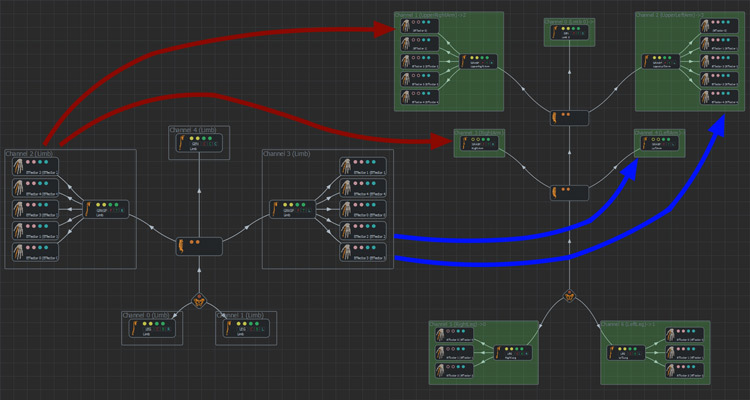 A Blend Shape Group contains any number of Blend Shapes (see below) and is equivalent to a blend shape node in Maya. A Blend Shape is equivalent to a weight on a blend shape node in Maya. Blend Shape values define how the character's geometry is deformed and they are stored in Motion files. other advanced physics properties of joints and rigid bodies. 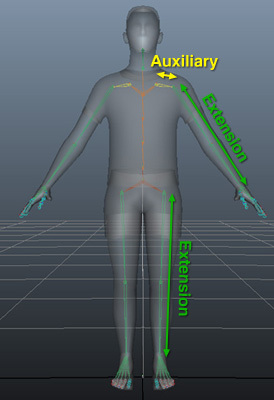 Body Parts are configured in the Skeleton Tab of the Character Maker, by right clicking on the joint and choosing the Edit Physics Properties entry. They are used only if a Physicalize Behavior is present in the behavior of the entity. To replay a motion on a particular skeleton (e.g. to process motion retargeting), the Golaem animation engine plays the motion channel by channel rather than joint by joint. This allows the replay's skeleton to be quite different from the motion's skeleton, but the motion to be quite similar. The Golaem Motion Mapping is a (.gmm) file. It is made with the Motion Mapping Tab of the Character Maker. 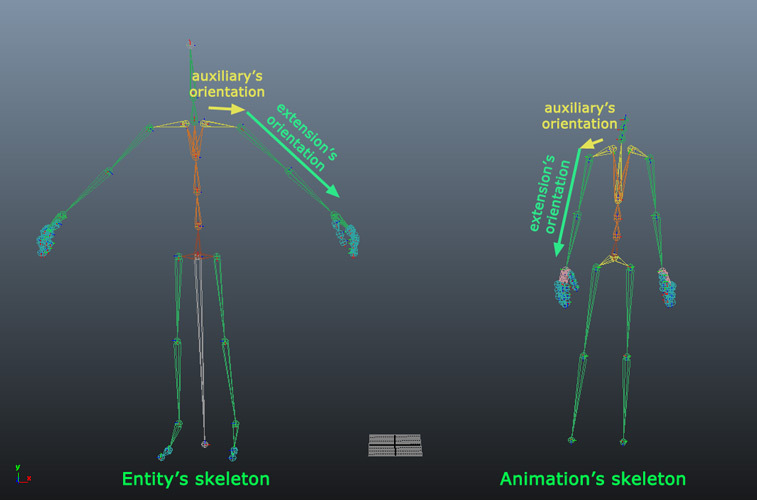 To be able to replay a motion on any kind of morphology, the Golaem animation engine relies on some abstractions of the skeleton rather than storing/playing the animations joint by joint. 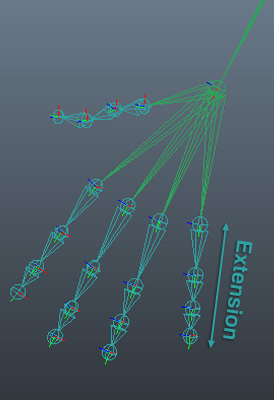 The Golaem animation engine stores the animation as a set of different channels, each channel storing the part of the motion on a Limb and all its Effectors. There is a channel for every Limb, and each Limb belongs to one single channel. 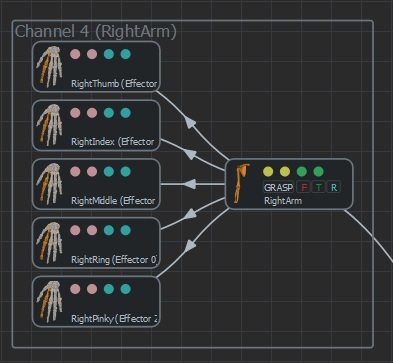 Each channel is given the name of the Limb it contains, as well as an id that is used to access the channel from the Motion Mapping Tab and some behaviors. The channel contains all the Skeleton Mapping Nodes and the containing bone chains of the Limb and all its Effectors. Channels are automatically configured each time a new limb is added. They are shown only when the Motion Mapping Tab of the Character Maker is selected. 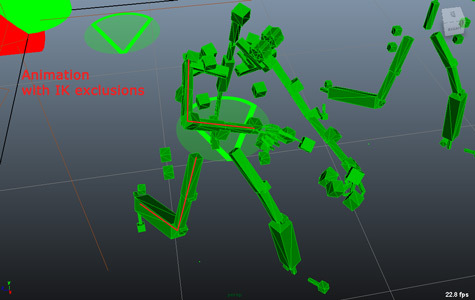 This also allows playing motions on skeletons with a different number of limbs than the original skeleton. For instance a biped motion could be replayed on a skeleton with 2 legs and 4 arms: the upper arms and lower arms would just have to replay the same animation channels. 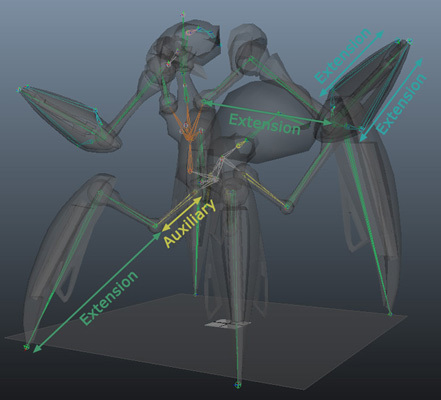 Example of mapping a human motion on a 4 arm biped.